With the increasing use of the iPad at homes, many traditional toys have made their way into the digital world. Earlier this month, we saw Creativium, an app that simulates paper theaters. Today, I'll be reviewing Puppet Pals 2, a creative app that lets you create and record your own stories using virtual puppets. Created by Polished Play, Puppet Pals 2 is the sequel to the well received Puppet Pals. Building on the original virtual puppet theater format, the new app has more characters, unique locations, new rides, and the ability to move your characters' arms and legs. Puppet Pals 2 lets you create animated videos using virtual puppets. To begin creating, first you select a location for your show. 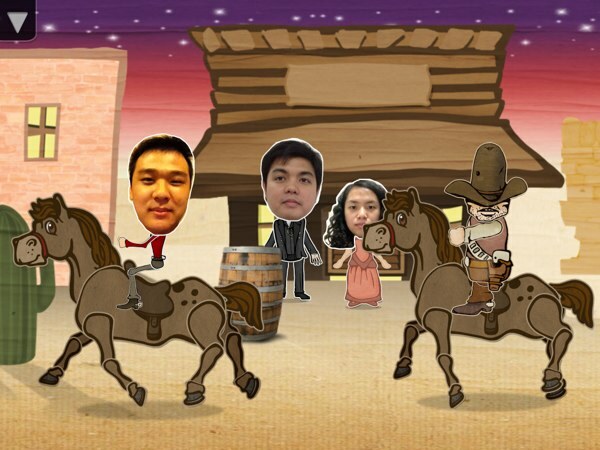 The app has six sets available: a city, a farm, a theater stage, an old cowboy town, an icy landscape, and the surface of the moon. You can also use a corresponding background music or turn it off completely. Next, you choose the characters to star in your story. As of the time of this writing, the app has a selection of 30 unique puppets, with more promised to roll out in future updates. The designs for these puppets range from more "regular" ones like a ballerina or a cowboy to historical figures like Abraham Lincoln and Vincent van Gogh, so you can create a wide spectrum of tales. 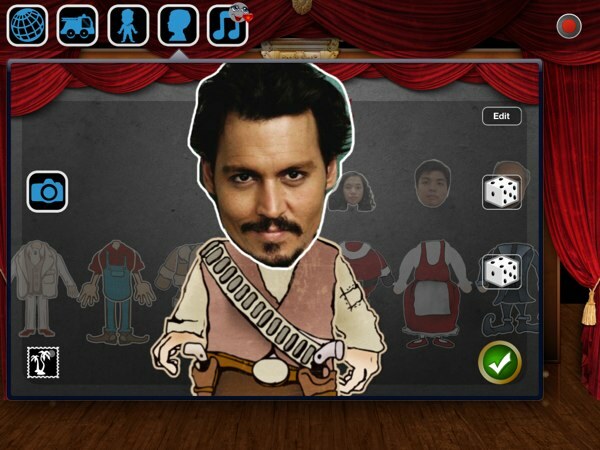 If you feel like none of the predefined puppets are suitable for your scenario, the app allows you to create new characters by mashing the available heads and bodies using a simple scroller interface. What's more, you can also make new puppets from your own photos! Simply take a picture or choose one from your Camera Roll, trace the head to cut it out, and stick it on a body. Much like real puppets, the characters have moveable joints, allowing you to move each individual arms and legs to create different poses for a more realistic effect. They also have a unique ability to "speak"; when you tap on a character and speak into the microphone, the app picks up your voice and moves the character's mouth accordingly. In addition to a new range of characters, Puppet Pals 2 also introduces a range of rides. 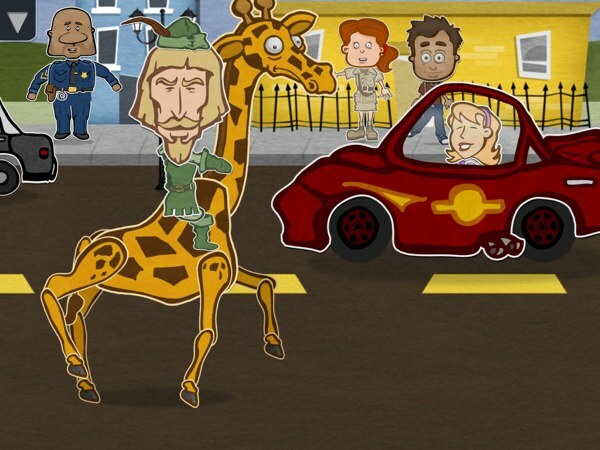 You can choose to have police cars, horses, and even giraffes to spice up your scenes. Your other characters can also ride them; simply drag it onto a ride. Once you have arranged your scene, you can start recording by tapping on the record button on the top right of the screen. One thing to note is that the app limits each recording session to two minutes, so plan your story and dialogs ahead before you start. After you have finished recording, you can choose to save your work into the app's library or redo the recording. It is also possible to export your recordings to the device's Camera Roll or share them via email. Puppet Pals 2 is a fantastic creation-based app suitable for juniors as young as six years old. Simple and intuitive, the app has a gentle learning curve, but you can always refer to the Tutorial if you are ever in doubt. Designed to facilitate learning in different fields, the app is suitable for use both at home and in a classroom setting. You can use the app with juniors to tell stories, present book reports, or recreate historical accounts. For more lesson ideas, the developers have published a Parent/Teacher Guide, which you can find in the app or on their website. As far as recording apps go, one of the most concerning things is storage usage. The developers do not specify how much space their app takes, but two videos at two minutes took up around 25 MB on my device. If storage is an issue on your device, I would suggest transferring the videos to a computer via Camera Roll and deleting them afterwards to free up some space. I also tried exporting a video at normal quality and then sharing it via email, and ended up with an 11 MB file. If you have a slower Internet connection on your device, you may want to transfer the file to your computer and compress it first. You can make custom puppets using your own photos. After experimenting with the app for some time, I have to say that I really like Puppet Pals 2! It's really versatile, suitable for use independently or in groups, and at home or in the classroom. Creative juniors will enjoy fabricating one story after another, while the more reserved ones can use it to overcome their nervousness of public speaking. I like that there is quite a selection of sets and puppets to create all sorts of stories. The fact that you can make new puppets using your photos really extends the app's life span as it basically gives you an endless choice of characters. I also like the idea of being able to manipulate the puppets' limbs and mouths as I narrate the story. Finally, I love the app for its rule-free gameplay, which encourages juniors to be creative. Want to recount your trip to the farm? You can. Recreate William Shakespeare's Romeo and Juliet? You can. Narrate an astronaut's landing on the Moon? You certainly can. The app even designs the Moon landscape to have low gravity, so you can make your characters bounce and float. With a large selection of locations and puppets, you can create unique stories. Entertaining and cleverly done, Puppet Pals 2 is a fantastic app with a lot of appeal. Juniors will love crafting stories with the app, and parents will enjoy watching their little ones hone their storytelling skills. I would highly recommend it to both parents and teachers who are looking for apps to support creative play and learning. To receive daily educational app reviews, please subscribe to our RSS feeds, follow us on Twitter, or like us on Facebook. Puppet Pals 2 is available for iPad/iPhone. Easy Studio. Intuitive app lets you make simple stop motion animations on your iPad. Cookie Next Door ~ Rainy Days. Record your own illustrated adventure. Game Your Video. Edit your videos in a fun, game-like environment.